Engineers at the University of Bath believe that almost all everyday household objects could be manufactured cheaply and quickly by appliances based on today’s rapid-prototyping machines. Rapid prototype machines are typically used to produce plastic components for industry, such as vehicle parts. The method they use, in which plastic is laid down in designs produced in 3D on computers, could be adapted to make many household items. But conventional rapid prototype machines are expensive, costing around UK25,000 (US$50,000). To reduce the cost of such machines, Dr Adrian Bowyer, of the University’s Centre for Biomimetics, believes that these machines should begin making copies of themselves. These could then be used to make further copies of themselves until there are so many machines that they become cheap enough for people to buy and use in their homes. Bowyer said the machines were a form of Universal Constructor, first proposed theoretically by the mathematician John von Neumann in the 1950s. He also said their progress would be similar to that of a species in nature – as the machines replicated, so their users would vary them to suit their needs, some making larger objects, some more accurate devices and some making devices more quickly. “People have been talking for years about the cost of these machines dropping to be about the same as a computer printer,” said Bowyer. “But it hasn’t happened. Maybe my idea will allow this to occur.” Bowyer is working on creating the 3D models needed for a rapid prototype machine to make a copy of itself. When this is complete, he will put these on a website so that all owners of an existing conventional machine can download them for free and begin making copies of his machine. The new copies can then be sold to other people, who can in turn copy the machine and sell on. He said that he has not taken out a patent and will not charge for creating the design for the machine. “The most interesting part of this is that we’re going to give it away,” he said. The machines would not be able to produce glass items or complex parts such as microchips, or objects that would work under intense heat, such as toasters. But a digital camera could be made for a few pounds, and a lens and computer chip bought separately and added later. The rapid prototype machines would be useful for producing items that are now expensive, such as small musical instruments. The items produced could be from a few millimetres to 300 millimetres in length, width and height. Larger items could be made simply by clipping together parts of this size. “At the moment an industrial company consists of hundreds of people building and making things. If these machines take off, it will give individual people the chance to do this themselves, and we are talking about making a lot of our consumer goods – the effect this has on industry and society could be dramatic,” concluded Bowyer. 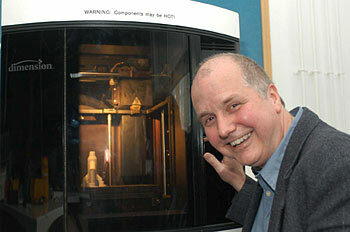 Pic of Dr Bowyer and rapid prototyping machine courtesy Bath University. Check the Bath University website for more info on building a cornucopia machine.